A satin chrome ceiling mount and chain suspension that cannot be seen in the image, with an antler design central column and three antler-like arms exiting underneath the bottom gallery. Each arm is finished with a lamp holder that features a matching metal candle drip and candle tube. Supplied with 50cm of flex and chain, together with a dual mount system that allows it to be semi-flush mounted as shown. Height adjustable at the time of fitting, minimum drop as a semi-flush 33cm – maximum drop using the supplied chain 80cm. The Elka three-armed ceiling light, a traditionally styled antler design dual mount ceiling light, finished in a soft satin chrome. 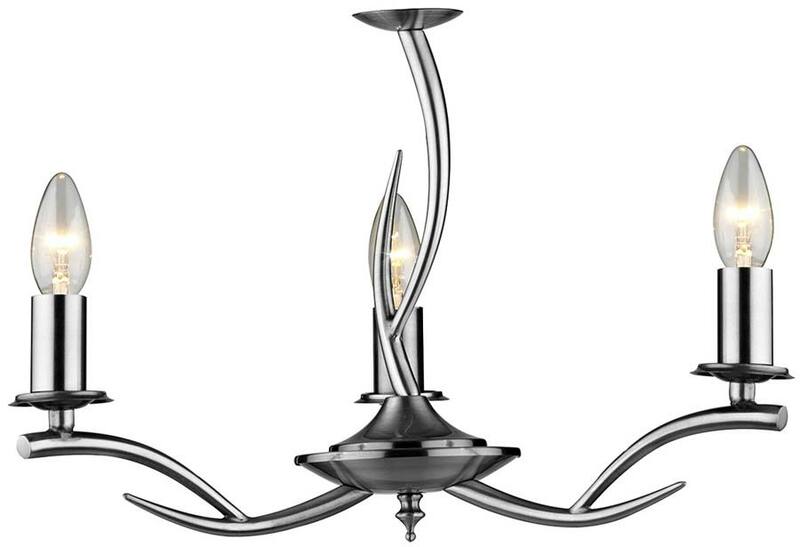 A flexible light fitting well suited to any traditional or modern setting and rooms with a lower ceiling. Other fittings in the Elka range can be viewed below and include a five-arm dual mount ceiling fitting and a two-lamp wall light.